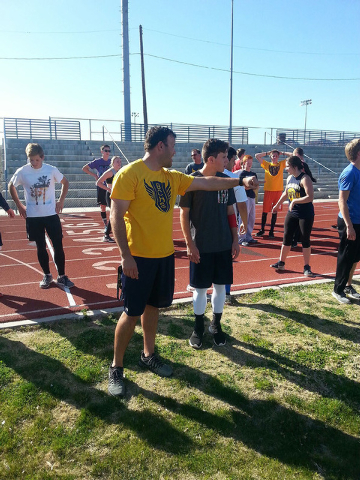 Boulder City boys track and field coach Josh Fisher has the largest group of athletes in his three seasons and he plans to make the best of it. The Eagles placed seventh at the Division I-A state meet in each of the past two seasons and Fisher said his team’s goal this May is to place in the top five. The Eagles return 11 lettermen, including five individual state meet qualifiers. Brooks Roe placed fourth in the state in the 300-meter hurdles, and Sam Gomez took fourth in the discus at state. In addition to Roe in the hurdles and junior Nick Pfieffer in the 400 meters, long jump, triple jump and pole vault, the strength of the boys team is the throwers. Brendan Cowley, Jack Rozycki, Andrew Sands and Trenton Motley will score team points for the Eagles in the shot put and discus. Tyler Campbell will lead the distance group that is coming off a strong season in cross-country. “Our men are young this year, but possess a great deal of natural talent. They have been working in the winter and pushing each other to get better and better. We placed seventh in each of the past two seasons with about 22 athletes, and now we have 45, so I am hoping to finish in the top five in the state in Division I-A,” Fisher said. The girls track and field team, coached by Steve Roe, has a roster of 27 athletes. The Lady Eagles return two state qualifiers in seniors Alexis Fenyves, who placed third at state last season in the triple jump, and Sariah Gneiting, who qualified in the discus. Senior Sam Hanson will lead her team in the 100 and 300 meter hurdles, while freshman Sierra Selinger is dominant in the 3,200 meters. Junior Tarah Cox will compete as a middle distance runner. Adrianne Hess will compete in the long jump, high jump and triple jump, and Bayden Huxford will compete as a sprinter, pole vaulter and relays. Katlyn Daly will help the team as a sprinter and discus thrower.